Can I Help You? II(138/365 v2.0) – Annoyingly Boring? Hadn’t pointed the camera towards the feeders in quite a while. Saw plenty of goldfinch as usual, a male and female cardinal and this guy. Red Bellied Woodpecker. He was being shy and wouldn’t come to the other side of the feeder. 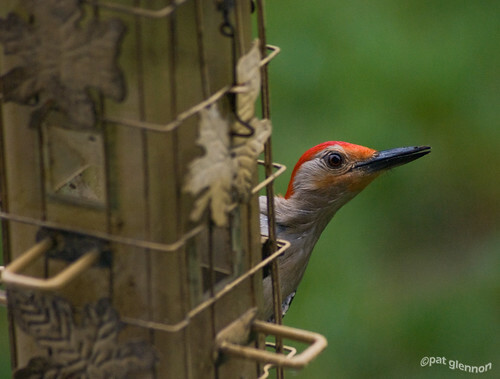 Funny thing about Red Bellied Woodpeckers is that their bellies are not red. Go figure. All this time I thought mine was a red-headed. Now I know. And you’re right, they are a bit camera shy. Seem to know when you’re there and position themselves just outside of a full on view. You are correct. Its bellies are not red but it is cute though! The dude that named’em was color blind …..
.-= Ruprecht´s last blog ..#164: Slouching Signal, Stalling Car =-. Ha! Yeah, a misnomer for sure! But I love that pose! .-= Maureen´s last blog ..Thank Goodness For Timmie’s =-.